We are delighted to announce that Bluebird Café is joining Television Centre from this winter. For 20 years Bluebird has been a landmark restaurant, café and retail venue on the Kings Road in the heart of Chelsea; a historic Art Deco site at 350 Kings Road. 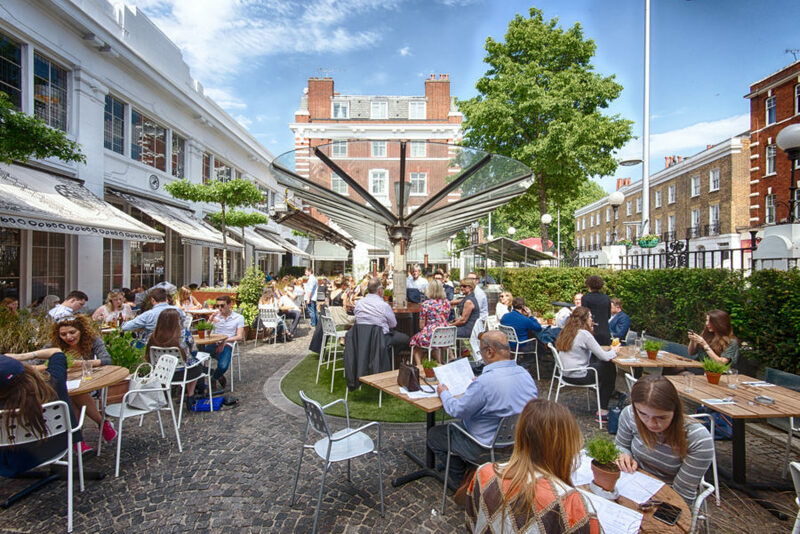 Originally the home of the Bluebird Motor Company in 1923, its famous café and courtyard have become Chelsea’s number one place to see and be seen, and the Restaurant has become an institution on the London dining scene. The new 5,000 sq ft site in White City will include a café, bar, deli and an outdoor terrace. Alistair Shaw, Managing Director of Television Centre, said: ‘We are excited to be able to announce that Bluebird will open its second ever site at Television Centre this year. As one of the most iconic names in London’s world-leading restaurant scene, this opening sets the tone for what will be a fantastic mix of experiences at Television Centre and in the wider £8bn regeneration of the White City area. We are pleased to be working with an operator of Des’ calibre, passion and track record, and look forward to welcoming Bluebird’s customers this winter when Television Centre opens to the public for the first time.